Once I realised that I loved wrapping, and I also loved mei tais, it was only a matter of time before I purchased a wrap conversion mei tai (WCMT). I browsed Etsy often, and visited the page for TopATop wrap conversions (affectionately nicknamed Chop-a-Chop) nearly daily for a couple weeks, ogling the beautiful mash-ups of wraps and fabric that Alina created. 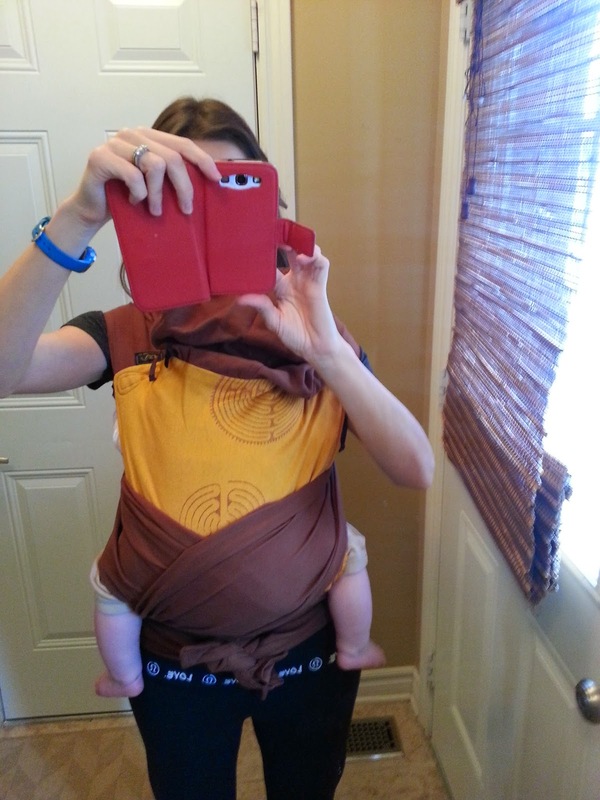 I read several reviews on TheBabywearer.com and online before deciding to take the plunge to purchase one of her carriers. I decided on a standard size (17x17) mash-up between a yellow Vatanai Labyrinth for the panel and Colimacon et Cie (C&C) brown straps. 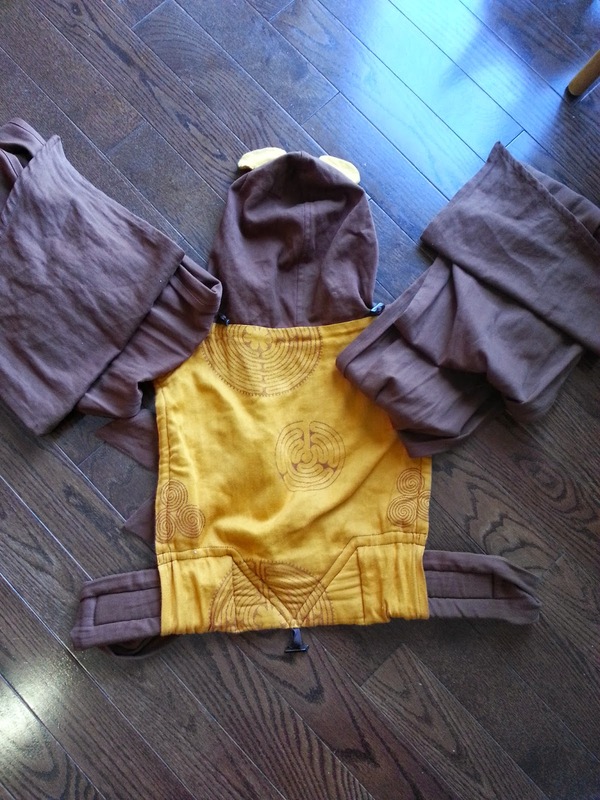 As this combination made me think of Winnie the Pooh Bear, I also added custom teddy ears to the hood. Once I had ordered, it took about five weeks for my carrier to be created and arrive from Israel. I opened the package and was pleased to see it arrived in a cute little tote bag with the TopATop logo on the front. Alina's workmanship was lovely, and the details on this carrier were so nice. The waist was lightly padded, so it had a bit of support but was still squishy. The waist had a cinching mechanism to make it more narrow for smaller babies. There was light legs out padding on the sides for baby's comfort. The hood was a hoody style with the little ears poking off the top. The hood was secured with little wooden beads that were hooked through loops on the straps or rolled onto itself to be tucked out of the way. The straps were unpadded wrap straps, and I loved the way I could spread the fabric underneath my son's legs to make it extra supportive. I wore this carrier often, even through my sister's baby shower, where my son slept soundly the whole time. It was very comfortable, even for extended periods of front or back wearing. I only sold this carrier when I went on a bit of a churning spree, and ended up ordering another TopATop to fill the void it left. Recommendation: I would recommend this carrier to anyone who is looking to get their first WCMT and who has patience. I have heard of wait times up to two months long to receive these carriers, so you will not have it overnight. The workmanship is lovely and the carrier is comfortable, so for me it made up for the slow processing and lack of communication from Alina.